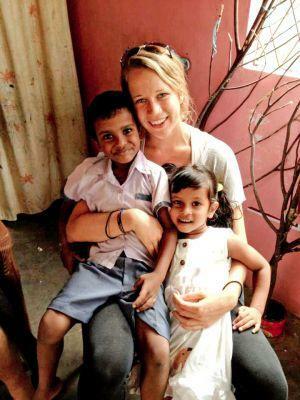 Twenty-two-year-old Lena Finucane, a recent graduate from St. Joseph’s University, decided to participate in Care and Medical Projects in Sri Lanka with Projects Abroad for two months. “I wanted to see how medicine is practiced in another country while helping people. Sri Lanka stood out as I have been there in my childhood,” she stated. “I was placed initially at Dutch Anne Pre-school with around 25 kids from the Tsunami Village. I helped the kids with the different classroom exercises, assisted the teachers, and played with the children. The kids were really cute and I liked them so much. I had not worked with the kids before, so this experience was unforgettable,” said Lena about her care placement. She then moved on to Panadura Base Hospital for her medical placement. “Don’t be surprised to see cows on the road and random people coming up to you to ask where you are from; Sri Lankan people are inquisitive yet so friendly. I noticed people eat with their hands instead of spoons and forks. I also liked the fruit and coconut stalls along the roads in Sri Lanka,” Lena added.